Abbey Blog Scam Review - Hide Your Wallet! 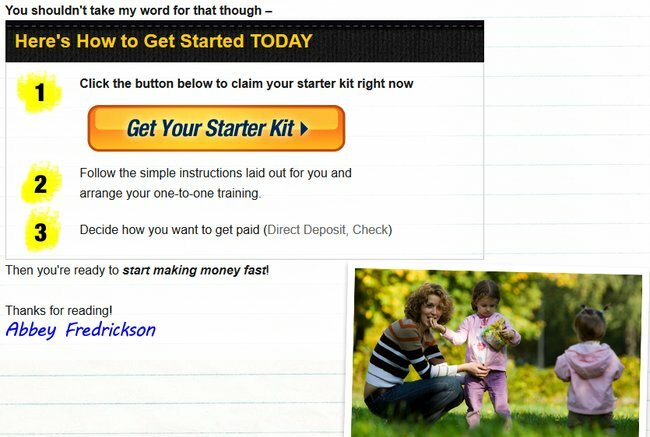 Abbey Blog scam features the story of a 28-year-old mother who makes $379 using a work-from-home system. Sounds too good to be true? Read this review to find out the truth! The Abbey Blog scam takes a more personal and intimate approach to sell a bogus work-from-home system, in the form of a blog post by a work at home mom named Abbey. The scammers clearly know that many stay at home mothers are actively looking to earn some money online, and they make this population their target. You may see Abbey Blog through some random pop-ups, or from the paid advertisements displayed in Google search results. At first glance, Abbey Blog may appear as an interesting blog post. Abbey talks about how she chanced upon a work-at-home opportunity online, and it changed her life forever. At the end of the post, Abbey invites you to try out the online opportunity for yourself, and she didn’t forget to attach a photograph of her and the daughters to make it more personal, and credible. But heed my advice – Abbey Blog is just a per-sell page to lure you into a make money online scam. Read on to see what does the mysterious online opportunity have to offer. If you click on ANY of the links in the Abbey Blog, you will be brought to the homepage of Easy Cash on Demand program at easy-cash-on-demand.org. We can already spot some red flags in the homepage of Easy Cash on Demand, so let’s go through them one by one in the rest of the review. Firstly, if you see the form on the right, you are required to not only provide your full name and email address, but your phone number as well in order to “check availability”. Well, it’s normal for websites to ask for name and email address to register an account, but if you encounter unknown websites that ask for your phone number, you have to be very careful. If you provide your phone number, even if you don’t buy Easy Cash on Demand in the end, you will be bombarded by calls from salespeople selling you more bogus “make money opportunities”. And the worse thing is, after providing your details, you are simply redirected to another sales page. The form is there just to collect your details, and nothing else. How do I know? Apparently, when I tried to click away from Easy Cash on Demand homepage, a pop-up appeared asking me to stay on the page (screenshot on right). Once I clicked stayed on page, I was congratulated because I qualified for their program, WITHOUT having to fill up any details in the form at all. So please, do not provide your phone number if you value your privacy. 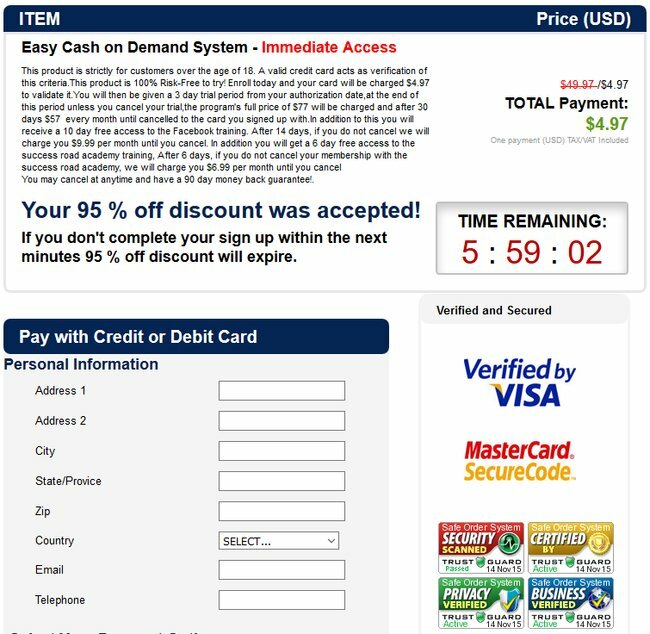 We will walk you through the rest of the sales page, and the payment page while exposing the scam tricks that Easy Cash on Demand try to pull on you. 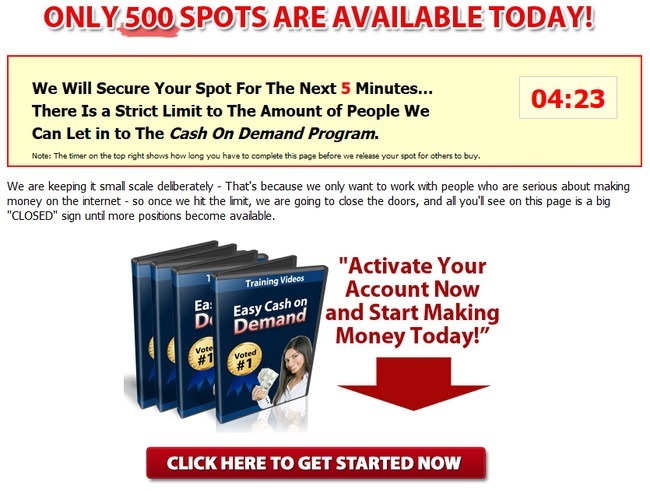 Easy Cash On Demand employs the scarcity tactic to make you read through their materials quickly, leaving you no time to analyze what they have presented. Firstly, you are told that there is a strict limit to the amount of people they can let into the Cash on Demand Program. On top of that, you are given a fake countdown timer to create the illusion of limited time to take action and secure the deal. For an unsuspecting and inexperienced victim, the countdown timer alone is enough to force him/her to skimp through the material and make an impulse purchase. However, if you simply refresh the page, you will realize that the timer refreshes itself. It is just a computer script that is set to reset itself every time the browser refreshes. I read through the rest of the sales page, and there wasn’t any useful information about how the program works. 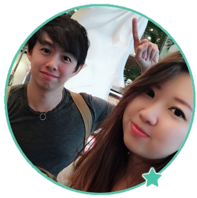 All I was given was hype and fake promises on earning a great deal of easy money online with Easy Cash On Demand program. It’s interesting to see how Easy Cash On Demand tries to clarify what they are not, instead of telling the potential buyers what the program is really about. And this is what separates a scam from a legitimate online opportunity – the real deal often explains their business model, and lets you try it out before deciding if you want to purchase. Unlike the scams, there is simply nothing to hide. Let’s say you had no time to detect any of the red flags up to this point, and you decided it’s a good idea to join Easy Cash On Demand Program, since it only costs you $4.97. If you click on any link within the sales page, you will be brought to this payment page. Again, they are using the fake countdown timer trick to force you into action. If you have fallen for the trick once, you are more than likely to fall for it again in the payment page. And if you do, chances are you don’t have time to read the fine prints. You are so busy filling up your details, and signing yourself into a major financial headache! Enroll today and your card will be charged $4.97 to validate it. You will then be given a 3 day trial period from your authorization date at the end of this period. Unless you cancel your trial, the program’s full price of $77 will be charged and after 30 days $57 every month until cancelled. You will receive 10 day free access to Facebook training. After 10 days, if you don’t cancel we will charge you $9.99 per month until you cancel. You get 5 day free access to the success road academy training. After 5 days, if you don’t cancel your membership with the success road academy, we will charge you $6.99 per month until you cancel. Seems like the final price is a hell lot more hefty than just $4.97! Easy Cash On Demand scam signs you up for some other “trainings”, including Facebook training and success road academy which weren’t even mentioned at all in the sales materials. I wouldn’t keep my hopes high for their 60 days money back guarantee, too. Why would you trust a company that signs you up for other shady programs without your knowledge, while pressuring you into making an impulse purchase at the same time? Should I Buy Easy Cash on Demand? The answer is clear. The final verdict NO, THIS IS A SCAM! Abbey Blog and Easy Cash on Demand are both scams. Stay away.